Johanna Reijnders was a New Netherland settler. Johanna is recorded with the patronymic Reijnders in all of her church records but one, where she is recorded as "Jannetje Barentje, h.v. Samuel Staets". However, Barent's son Barent, the husband of Hester Leisler, also appears to have used Rynders as a surname. Samuel returned to Amsterdam to train as a surgeon. There he married Johanna on 28 Nov 1684. They baptized their first child, Sarah on 20 Apr 1687 in Amsterdam. Samuel's brother, Joachim was married to Antie Barents. Perhaps Johanna has some relation to Antie's father. According the marriage record she was 19 years of age and assisted by her mother Geertruijd Jans. 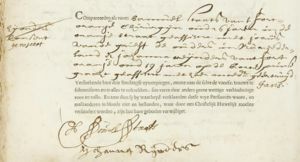 Johanna Rijnders married Samuel Staats in Amsterdam, Netherlands, on 11 October 1684. The marriage record describes her as 19 years old and a native of Fort Orange in New Netherland (later Albany, New York). No record of her baptism in Albany survives, as there are no Albany church records from that time. She was assisted in her wedding by her mother, Geertruijd Jans. Transcript: Samuel Staats van 't fort oranje, chirurgijn, 26 jaren, in de oranje straat, geassisteert met Johannis van de Grieft (Johannis van de Grift ?) de ouders in Nieu nederland & Johanna Reijnders van t fort oranje, oud 19 jaren, op de barent prinsegracht, geassisteert met haar moeder Geertruijd Jans signed Samuel Staats, Johanna Rijnders. Samuel Staats from the fort orange, physician, 26 years of age, in the oranje straat, assisted with Johannis van de Grieft, parents in New Netherland & Johanna Reijnder from the fort orange, age 19 years, at the barent prinsegracht assisted with her mother Geertruijd Jans. 1689 Jun 16 Catalina, Mr. Samuel Staets, Johanna Reijnardts. Wit. : Jan Bruijn, Henricus de Meijert, Debora Meijert. 1690 Dec 21 Anna Elisabeth, Dr. Samuel Staets, Johanna Reijenderts. Wit. : Jochem Staets, Chiliaen Van Renselaer, Anna Reijnders. 1694 Jan 31 Johanna, Mr. Samuel Staets, Johanna Reijniers. Wit. : Capt. Gerard Couw, Alegonda Van Hertsbergen. ↑ Thomas Grier Evans. "Baptisms from 1639 to 1730 in the Reformed Dutch Church, New York." In Collections of the New-York Genealogical and Biographical Society. Vol. II. New York: Printed for the Society, 1890. WikiTree profile Reinders-30 created through the import of Morrison Family Tree.ged on Aug 15, 2012 by Shawna Morrison. WikiTree profile Reinders-25 created through the import of AncMariePopham.GED on Dec 3, 2011 by Jorge Monasterio. WikiTree profile Reinders-174 created by Timothy Broyles on 30 Nov 2017. No known carriers of Johanna's mitochondrial DNA have taken an mtDNA test. Her mother according the marriage record was Geertruijd Jans and Johanna was 19 years of age ..
As she was part of the community and not believed to have been a settler or a descendant, I'm making Dutch Roots the project profile manager. Her ancestry is a bit complicated and it is uncertain that she is tied to the right father and siblings. It might help to clarify things if her marriage record could be located. She and Samuel were married on 28 Nov 1684 in Amsterdam. These are the same and can be merged thanks ! Johanna is 34 degrees from Graham Chapman, 23 degrees from Janet Wild and 12 degrees from Henry VIII of England on our single family tree. Login to find your connection.